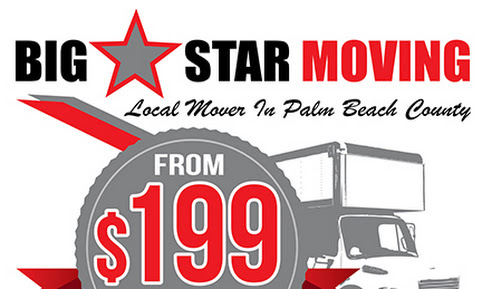 Big Star Moving is your local moving specialist for customers located in West Palm Beach, Florida. We offer a range in services to help you get your move completed quick, easy, and flawlessly. The first step in each move our crews perform is Home Prep – Our moving experts are professionally trained and take all necessary precautions to make sure your home looks like they were never there. In order to do this our crews use special padding and runners to cover and protect your door jambs, flooring, banisters, etc. This process is important to keep your home clean and protected. Movers' crews will begin by wrapping each piece of furniture with thick furniture blankets as well as shrink wrap. including time spent traveling between your locations. It may take longer if you live at a location with an elevator, multiple flights of stairs, or if there is a long walk from where the truck can park to your front door. Service Charge – Our Service Charge is a flat fee that you pay, as a deposit to book your move. 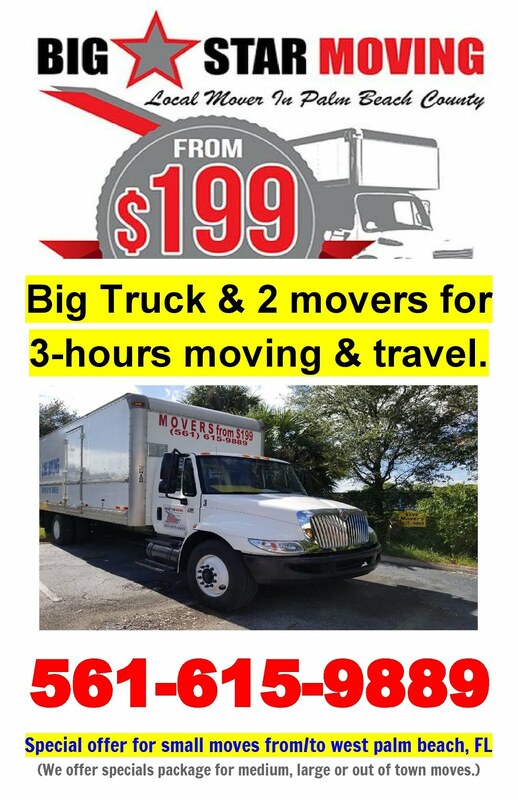 The service charge includes the cost of the following; a fully equipped moving truck, all necessary protective supplies (no separate or hidden fees), and the time it takes for your crew to get to/from your home. Big Star Moving Services – Busy with work, unplanned, or unexpected move. Allow our Big Star Moving Services team to take care of every aspect of your move from start to finish. Included in our Elite Moving Services is our most experienced and expert movers, planners, and coordinators. Additionally, you will receive the top of the line in all our additional services including; Mirror Image (Packing/Unpacking), Fine Art Handling, Wine Collection Moving, Piano Moving, and Installation/IT Services. Sit back, relax, and let us handle your move.